Answer: Many courses in this area seem to be having the same problem. Coots are considered migratory birds and as such are regulated by the U.S. Fish and Wildlife Service (FWS) under the Migratory Bird Treaty Act. A permit from the FWS may be required for removal of coots. Additional information can be found on their website. 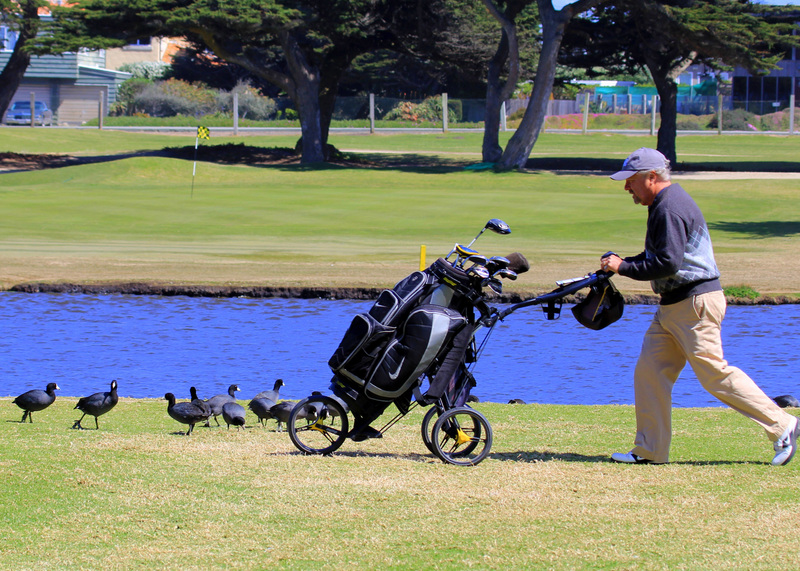 According to DFG Environmental Scientist Jeff Cann who oversees Monterey County, many courses in this area use trained dogs to haze waterfowl off the greens. Hazing coots is a legal activity but it is recommended that folks contact the professionals at the U.S. Department of Agriculture Animal and Plant Health Inspection Service (APHIS) for information. APHIS has extensive experience with hazing and removal of nuisance wildlife, such as coots. Coot populations in our area fluctuate as new birds migrate through in fall and winter, and others leave the area. You can try applying mylar reflective tape streamers on poles in areas the coots use to scare them off, but the birds usually get used to this. In addition, these might be distracting to golfers. Licensed hunters can harvest coots during the waterfowl hunting season, but discharging a firearm on the golf course is probably not legal in your area. Check with your local sheriff or police department to find out. Courses in more rural areas can employ this method of control and hazing. Some airports use sonic devices with some success to repel a variety of types of birds. I am not aware of focused studies on using them to repel coots, however. You can try contacting the USDA Wildlife Services offices for information on dealing with nuisance waterfowl or check with the FWS permitting office for additional assistance. Bottom line, not much will help repel the coots as long as there is food (grass on the course) and water available for them to drink and relax on. Shooting turkeys within city limits? Answer: Turkeys can be taken under a hunting license with air rifles firing pellets and powered by compressed air or gas (0.177 caliber minimum for taking wild turkey), but I seriously doubt you can shoot anything within the city limits there! It depends on local city and county ordinances on discharging air rifles within the city limits. Fish and Game Section 3004(a) generally prohibits the discharge of any deadly weapon while hunting within 150 yards of a building without specific consent of the owner. Most city and county ordinances say, “No discharging of firearms or other dangerous weapons,” which would include air rifles. Check with the local Sheriff’s Department for the local policies to be sure. Using trout for bait in ocean waters? Answer: It is legal as long as each angler never possesses more than the legal limit possession limit for trout in that area (regardless of whether the fish are brought in from elsewhere). As long as the fish were taken legally, they can be used for bait in the ocean waters of the state. Pig hunting with an AR-type 308 rifle with 10-round magazine? Answer: Yes. Any rifle that is legal to possess in California and that uses centerfire ammunition may be used to take big game, including pigs. Just remember to use non-lead ammunition when in condor country. This entry was posted in Bag Limits/ Possession, Bait, Firearms/Ammunition, Nuisance Animals & Pests, Regulations, Saltwater Fishing, Turkey, Wild Pigs and tagged ammunition, big game hunting, firearms, nuisance wildlife, ocean fishing, pig hunting, turkey hunting. Bookmark the permalink.